Periodically I will take one of my rifle builds and break down all of the parts used to build it. If a part is not listed, such as an end plate, it is because it is a standard AR part that does not need mentioned if there is nothing overly special about it. I will also do my best to give you a link to where you can find the product for sale. New for 2014, Diamondhead-USA has announced their Diamondhead “T-Brake” Muzzle Brake. The Diamondhead-USA “T-Brake”, which is triangular in shape, was designed specifically to create a greater surface area on the bottom of the brake for the gas to apply downward pressure. This premium-grade muzzle brake is machined out of 4140 steel and will be available in February 2014. Diamondhead-USA has released their new Diamond (Flip-Up) Polymer Sight for both the front and rear sighting needs of your AR-15 and Modern Sporting Rifles. 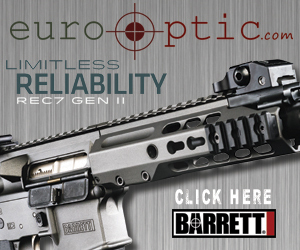 These sights are built with advanced polymer/composite construction for strength, lightweight and exceptional durability. Both of these sights can be used with any other Diamondhead-USA diamond-shaped apertures. Similar in function to Diamondhead-USA’s already popular line of Diamond sights, the Polymer versions also allow for faster target acquisition and sight alignment when used as a pair against the speed of traditional back-up sighting systems. As with the Diamond sights, the new Polymer sights will feature the proprietary reference posts and horizon bars. The Diamondhead-USA Polymer Rear Sight will function just as well with AR-15’s fitted with a factory handguard and a fixed front sight or can be paired with any picatinny rail-mounted Diamondhead-USA front sight. These sights include a NiteBrite™ Photoluminescent Insert that can be charged by either natural light or with a flashlight. The photoluminescence is more cost effective than tritium, but does require a light source to charge prior to using. Both sights are spring-loaded and will flip up quickly with the push of a button and will stay up securely until they are no longer needed and can be folded down flat without the need of pressing a button again to release a locking mechanism. The push buttons offer a large surface and positive texture to engage the sights into the open position. The push buttons have enough resistance that should mitigate any accidental engagements of the sights until they are needed, though will not require brute force to activate. The rear sight will fold down completely with either the small or large aperture in position which is unlike a lot of back-up sights that use a 90 degree swivel for their dual-apertures that do not allow the sight to fully close depending on which aperture is chosen. The rear sight allows you to select one of three sighting options with a small aperture for precision shooting, a large aperture for CQB/CQC shooting, and the absence of a rear aperture by selecting the flat mid-position for use with the diamond-shaped sight exteriors and photoluminescent inserts, particularly useful in low-light CQB/CQC scenarios. For installation, both the front and rear sights will need to be slid onto the picatinny rail and secured with the included nut and bolt which is installed with a cross-tip screwdriver. The rear sight’s windage knob is adjustable with a flat-head screwdriver or similar sized flat metal object in 0.5 MOA steps. I attempted to use a dime to see if that would work in a pinch and found that it would not fit to turn the dial. On the front sight there is no need for special sighting tools for adjusting elevation. To adjust the elevation, there is a dial on the rear of the sight that can be adjusted to the right or to the left of the shooter in order to raise or lower the elevation. The elevation dial is recessed and has enough tension applied to prevent any inadvertent adjustments. I was able to adjust the elevation dial by using a fingernail; however, you may want to have a smaller flat-head screwdriver on hand if you find the fingernail method not to work in your favor. As with other polymer backup sights, the Diamondhead-USA Polymer front sight is not suitable for gas block mounting due to heat-related issues from the barrel damaging the polymer. Diamondhead-USA recommends that the polymer sights should be only mounted on picatinny rail sections and flattop upper receivers. For those who will be running the Diamondhead-USA Polymer sights with an electronic optic, these sights are same plane for both apertures and are at the same exact height as factory A2 sights. The Diamondhead-USA Diamond (Flip-Up) Polymer Sights are expected to be introduced at $119.95 for the set and are anticipated to be released for sale sometime after the 2014 SHOT Show. The SHOT Show is right around the corner from January 14-17, 2014, at the Sands Expo Center in Las Vegas. If you plan on attending SHOT Show, make sure you stop by and check out the Diamondhead-USA product line at booth #8503. For more information about Diamondhead-USA, check out their webpage at http://diamondhead-usa.com/. Review originally written for Arms Collective by zero7one.